Oil swishing with Mint + Myrrh Oil Swishing Serum sparks your healthiest smile ever! Oil pulling or swishing is a current health craze yet it has been part of oral care routines since the early days of Ayurvedic and Egyptian medicines. Mint + Myrrh Oil Swishing Serum abounds with perfectly potent and genuinely gentle botanical-biotics. As part of your morning oral care routine, it may protect the mouth’s microbiome from plaque, gingivitis, tooth decay, halitosis, canker sores, sensitive gums, and periodontitis. Mint + Myrrh Oil Swishing Serum anoints your mouth with effective essences to draw toxins from the mouth, refresh the oral cavity, and address conditions like plaque, gingivitis, tooth decay, and halitosis. Oral oil brushing is a periodontal practice used by early Egyptians and Ayurvedic Indians to preserve their oral health. Numerous mummified corpses in both cultures have been found with strong, healthy teeth still intact several millennia later. This simple-yet-powerful practice cleans and protects the teeth and gums by deeply drawing out toxins, brightening and whitening teeth, and healing and sealing the gums. Mint + Myrrh Oil Swishing Serum is a masterful mix of time-treasured and scientifically measured botanical-biotics including fortifying frankincense, majestic myrrh, antiseptic oregano, toning thyme linalool, astringent thyme, therapeutic tea tree, and healing CoQ10 all super-saturated in nutraceutical MCT coconut oil. Swishing with Co Q10 gets it deep between the teeth and into gum pockets, increasing concentration where it is needed most, suppressing inflammation and encouraging happy, pink gums. Medium chain triglycerides, or MCT oil, is an ultra-concentrated coconut oil. By infusing your oral ecology with nourishing MCT the detoxification process deepens, and the mouth achieves optimal balance. Swish a squirt of Mint + Myrrh Oil Swishing Serum for ten minutes once a day. Take care not to swallow the oil and to swish vigorously! Frankincense (Boswellia Carterii) – Anoint the sacred chamber of your oral cavity with the fortifying power of frankincense. Each tear-drop from the Tree of Life offers blessings to the gums, mouth, and teeth. Frankincense is antiseptic, antibacterial, and is an ancient remedy for halitosis, mouth sores, tooth pain, and cavities. Myrrh (Commiphora Myrrha) – Who knew that the ancient wise men were actually carrying two of nature’s best oral care elixirs? Working together with frankincense, magnificent myrrh helps to prevent periodontal imbalances in the mouth. 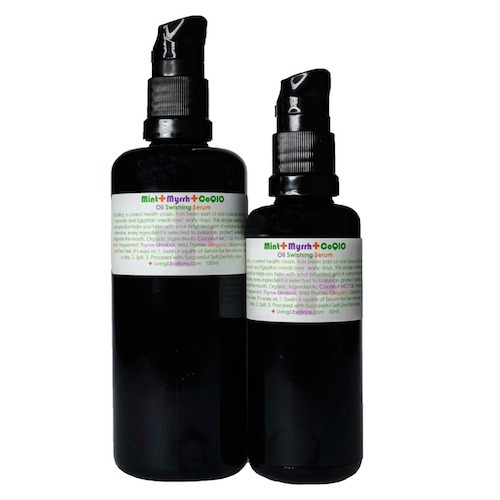 Myrrh is a stimulating astringent with an affinity for sore gums, canker sores, swollen gums, and wounds. Peppermint (Mentha Piperita) – Our pure, unparalleled peppermint oil is distilled by a fourth generations family in France. This minty-fresh offering is magnifique for the mouth thanks to its anti-inflammatory, antioxidant, and analgesic properties. Thyme Linalool (Thymus Officinalis Linalool) – In no thyme flat, thyme linalool descends deep into every crevice and cranny, toning tissues between the teeth. It is gentle enough for sensitive gums. Wild Thyme (Thymus Vulgaris) – Wild thyme oil freshens the breath and has been used since medieval times for comprehensive oral protection. Oregano (Origanum Vulgare) – Fresh, fragrant oregano oil is antibacterial, antifungal, antibiotic, and antimicrobial from its extremely high levels of phenol compounds. Oregano is said to support immunity, prevent the buildup of plaque, and guard against gum disease.